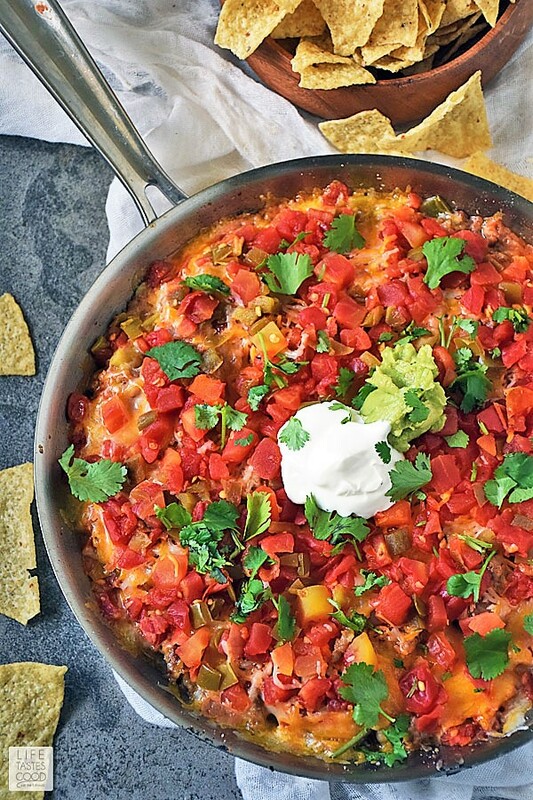 Be ready for the big game with my Hot Mexican Dip recipe! 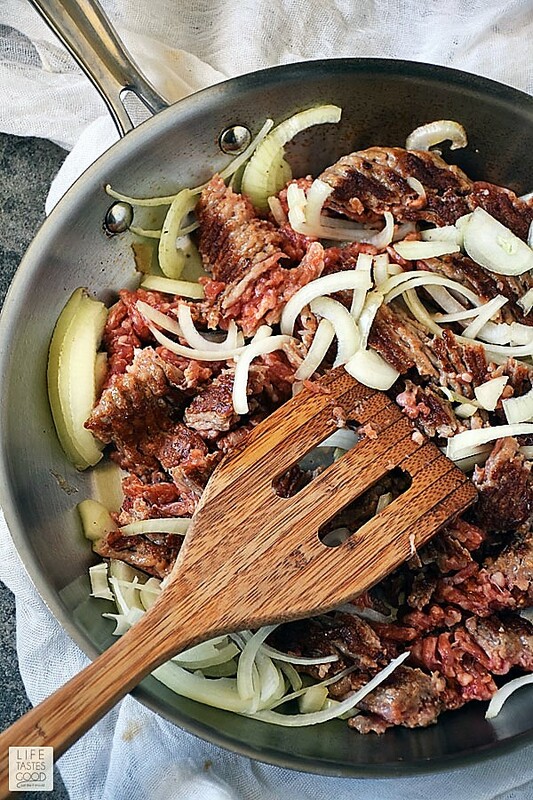 This is our GO-TO easy football food made all in one skillet for easy clean up. 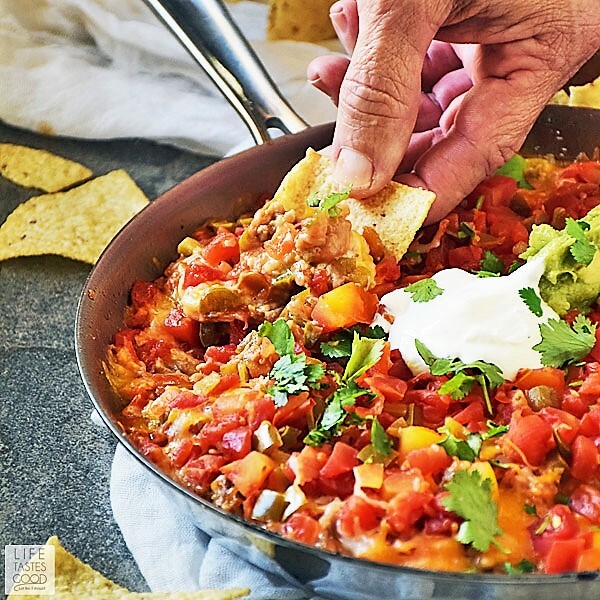 With layers of beans, spicy sausage and onions, jalapenos, cheese, and salsa, this Hot Mexican Dip is a real crowd pleaser! This recipe for Hot Mexican Dip is an easy football food recipe that serves 4, so it's perfect for a smaller crowd. It's a quick and easy appetizer recipe that's hot and ready in about 20 minutes or less. Seriously! Once the sausage is cooked through, it's just a matter of layering everything in the skillet and melting the cheese. 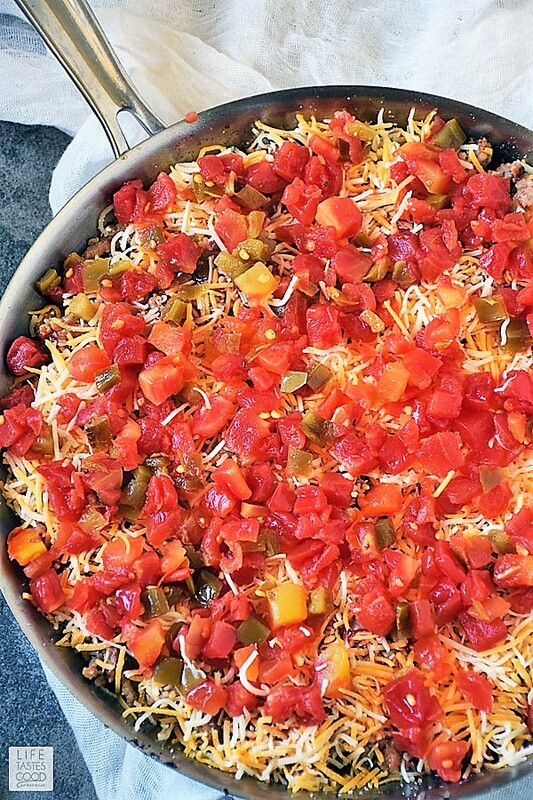 It doesn't get much easier than that for a dip recipe that is this BIG on flavor! It's IMPOSSIBLE to take just one bite!! 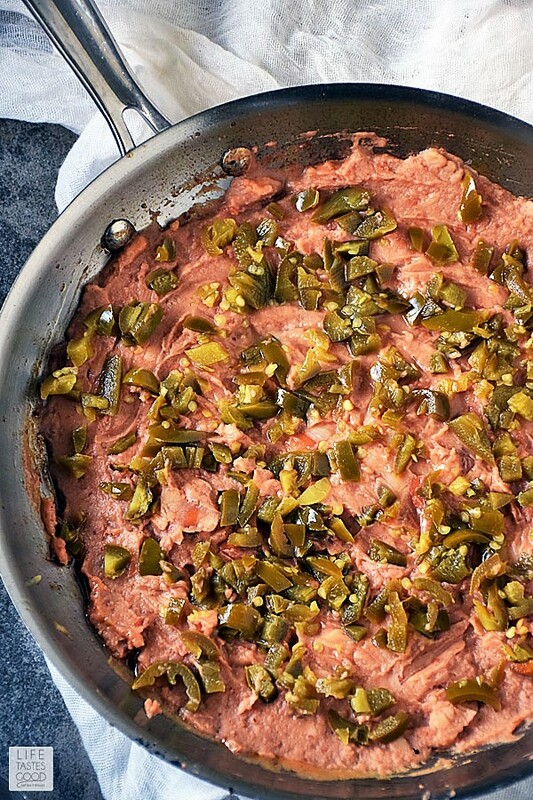 I like to use a 10" skillet with a tight fitting lid to melt the cheese on the stove top, but this Hot Mexican Dip can be made in any oven safe skillet. So if you don't have one with a lid, don't despair. Just be sure the skillet is oven safe and you'll be able to melt the cheese under the broiler. For more flavor, I like to sear the sausage, so I put it in the skillet all in one piece as it comes out of the package and let it sear about 3-5 minutes until a nice crust forms on one side. Then I add the onions and start to break up the sausage into small pieces and cook through. Once cooked through, give it a taste and season with salt and pepper as needed. Typically I use fresh tomatoes on top of this dip, but right now tomatoes are crazy expensive, so I used a 10 ounce can of diced tomatoes with green chilies that I drained first. It was a good alternative, but if you can get fresh tomatoes don't be afraid to use them. For a visual reference, check out my how-to photo tutorial below the recipe to give you a visual step-by-step guide to make this recipe. Are you ready for some football?! 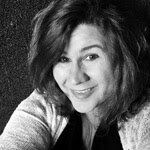 To be honest, we used to watch our favorite team religiously, but as we got older and life took over, we just didn't have as much time to enjoy the sport, but we still watch the big games like the Super Bowl. When we do have time to watch a game, it's a tradition for us to have this appetizer recipe for Hot Mexican Dip ready to go. It is our go-to football food! 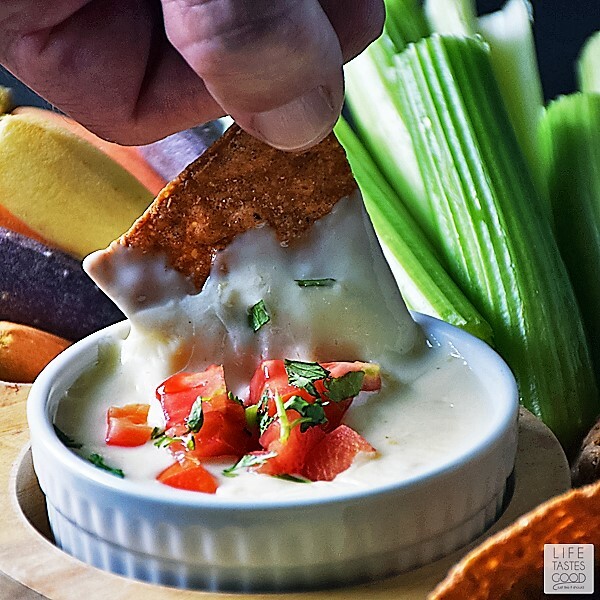 I also like to make other easy football food recipes like my super easy, restaurant style Queso Blanco Dip (white cheese dip). Made in the microwave, this queso recipe is super cheesy delicious and goes great with chips and/or fresh, crunchy vegetables for dipping. Chicken Wings are a MUST for football food, and they also offer a great option for anyone on a low carb diet. 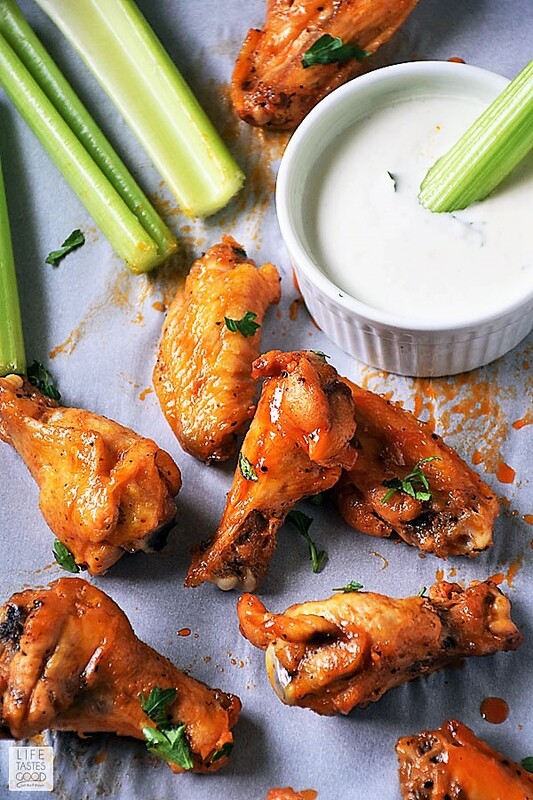 My Low Carb Buffalo Wings with the most AMAZING Gorgonzola sauce are pretty easy to make and the flavor combination is out of this world! One of my MOST POPULAR recipes is a meatless appetizer with a dairy free ranch dressing that will blow your mind! 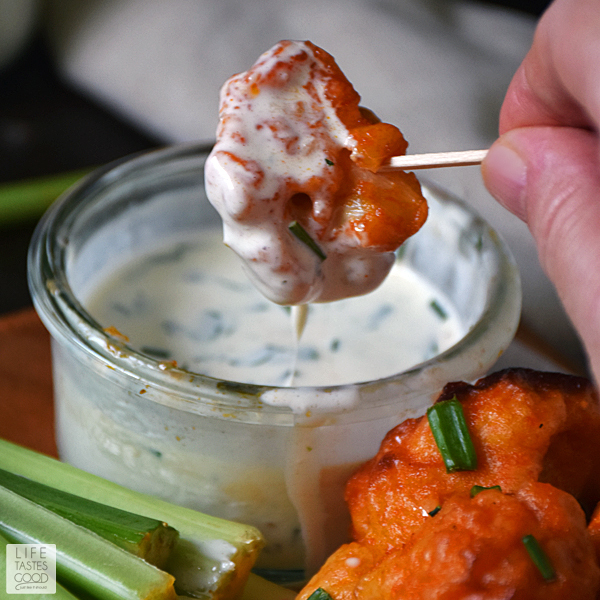 Check out my Baked Buffalo Cauliflower Bites for a healthier option that mimics buffalo wings. My very meat and potatoes husband asks me to make these Baked Buffalo Cauliflower Bites all! the! time! When I want to serve more of a meal, I set up a Taco Rice Bowl bar and let everyone custom make their own Taco Rice Bowl. 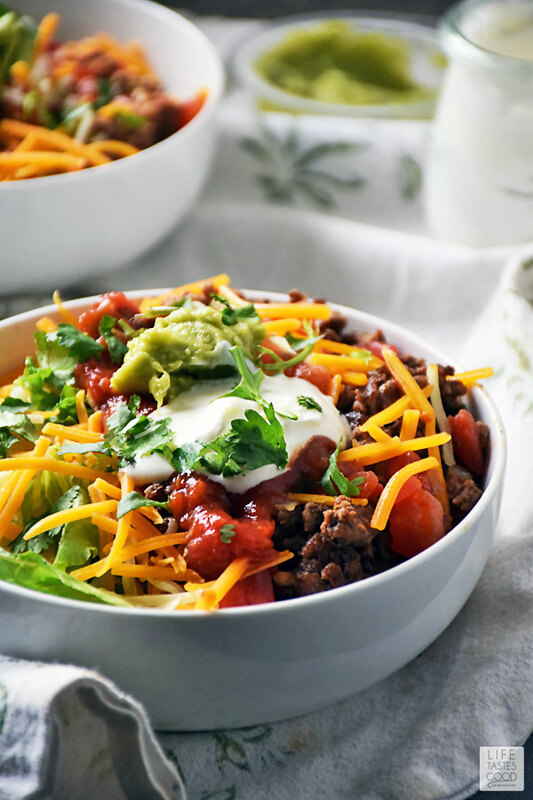 It's loaded with all the Mexican inspired flavors we love in a hearty meal that's easy to set up as a bar for game day parties. 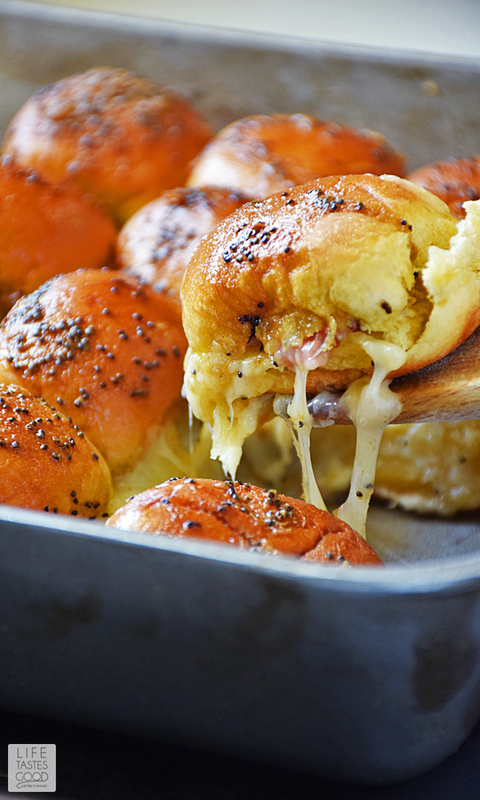 For a game day sandwich recipe, my favorite are these Baked Ham and Cheese Sliders. They are super easy to assemble and then bake all in one pan. The buttery mustard glaze puts these sliders over the top! There are so many easy football food recipes to help make your game day a tasty one, it's impossible to list them all, so be sure to browse my appetizer's page to pick which ones are best for you. 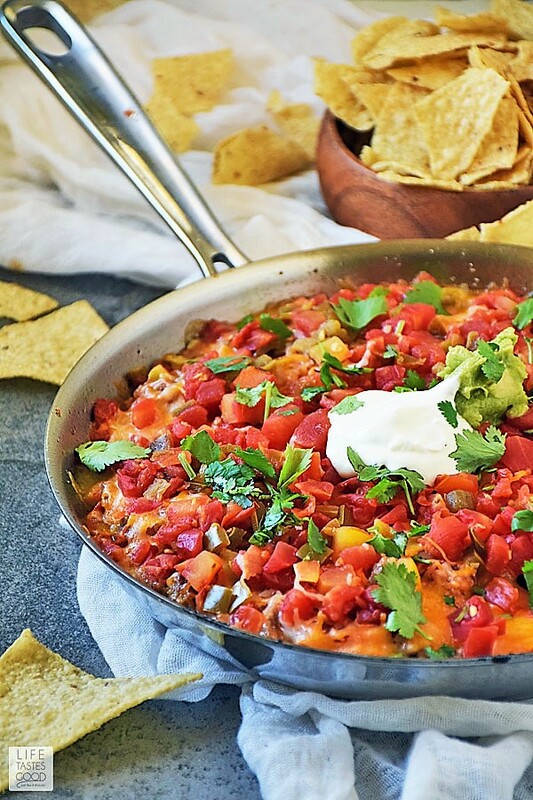 Be ready for the big game with my Hot Mexican Dip recipe! 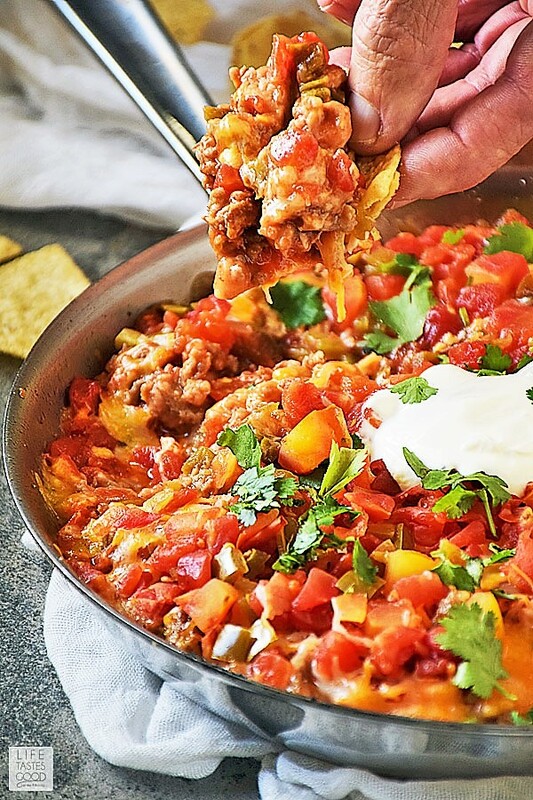 This is our GO-TO easy football food made all in one skillet for easy clean up. Over mid-high heat, sear sausage in skillet to get a nice crisp on one side - about 5 minutes. Add 1/2 cup sliced onions with a pinch of salt and pepper. 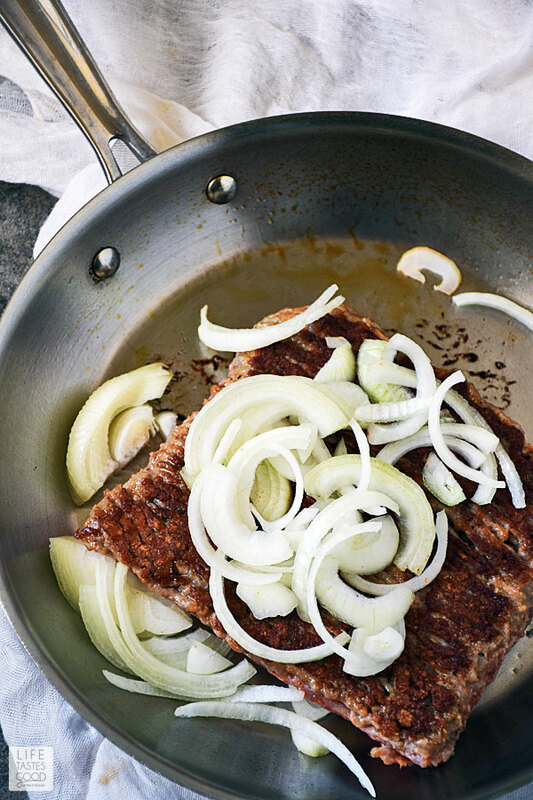 Break up sausage and continue to cook until onions are tender and sausage is cooked through being sure to scrape any browned bits from the bottom of the skillet. About another 5 minutes. Give it a taste and add salt and pepper to your liking. Remove from skillet. Reduce heat to medium and add refried beans to skillet. Spread to cover bottom of skillet and top with 4 ounces diced jalapenos or 4 ounces diced green chilies if you don't want to much spiciness. Top with reserved sausage mixture. Top with 1 cup salsa. Top with 1 1/2 cups shredded Mexican cheese. Top with fresh tomatoes or 10 ounce can tomatoes with green chilies (drained). Cover to melt cheese. Garnish with freshly chopped cilantro and serve with sour cream, guacamole and tortilla chips. Alternately, you can place the whole skillet under the broiler until the cheese is melted. Watch it carefully so it doesn't burn. Enjoy! NOTE: This recipe was originally published on Life Tastes Good on August 9, 2012. I updated the recipe with new photos and a few tweaks I've made over the years. I hope you enjoy this new and improved version. Over mid-high heat, sear sausage in skillet to get a nice crisp on one side - about 5 minutes. Add 1/2 cup sliced onions with a pinch of salt and pepper. 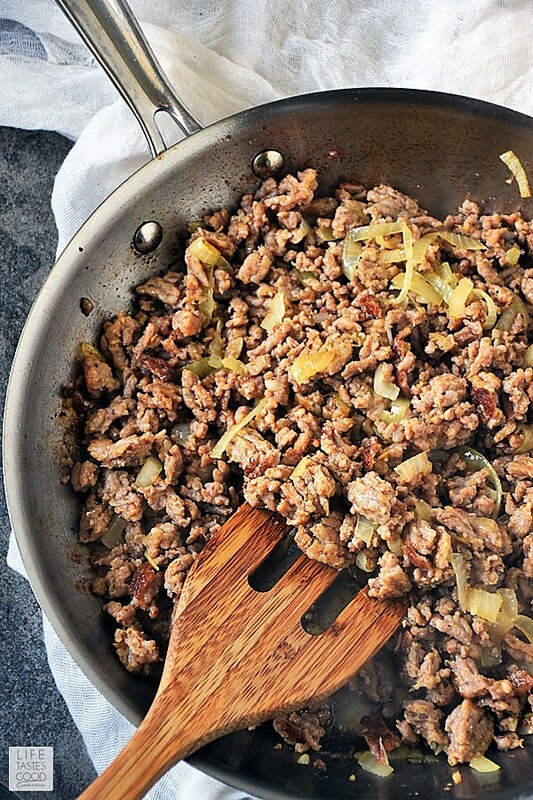 Break up sausage and continue to cook until onions are tender and sausage is cooked through being sure to scrape any browned bits from the bottom of the skillet. About another 5 minutes. Give it a taste and add salt and pepper to your liking. Remove from skillet. Reduce heat to medium and add refried beans to skillet. Spread to cover bottom of skillet and top with 4 ounces diced jalapenos or 4 ounces diced green chilies if you don't want to much spiciness. Top with reserved sausage mixture. Top with 1 cup salsa. Top with 1 1/2 cups shredded Mexican cheese. Top with fresh tomatoes or 10 ounce can tomatoes with green chilies (drained). Cover to melt cheese. Garnish with freshly chopped cilantro and serve with sour cream, guacamole and tortilla chips. Alternately, you can place the whole skillet under the broiler until the cheese is melted. Watch it carefully so it doesn't burn. Enjoy! French Onion Dip by What Smells So Good? Hot dayum! I am not ready for football....But that dip can live on my coffee table ANYDAY! Hungry now! Perfect for game day!! I'd make this my dinner!! Sounds absolutely delicious! I'll eat it anytime and not just game day! Great recipe! I love the extra spice from a regular taco dip- look great!